Last but not least out of the Phantasium live reports, the review of the group pretty much everyone in attendance showed up for at the fifth anniversary opening night: Abney Park, the Seattle-based sixtet that is probably the best-known steampunk band out there. 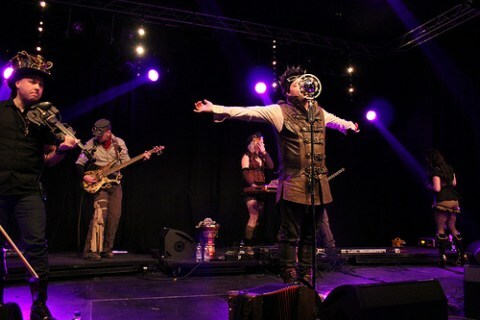 The first mainland European (as they have previously performed in the UK) concert of the band was something many steampunks and dieselpunks did not want to miss and so they came down from several countries to witness the musical exploits of the crew of the HMS Ophelia. For about a whopping two hours, with only a short five-minute break, they treated the audience with some of their finest songs. They played classics such as “Airship Pirates”, “Building Steam”, “The End of Days”, “Neo Bedouin”, “Letters (Letters Between a Little Boy & Himself as an Adult)”, “Victorian Vigilante”, “Evil Man” and many, many more from their previously released albums, making their setlist a great variety of older and newer songs. Each song was brought with emotion and energy and the band had absolutely no issue whatsoever getting the crowd dancing and enjoying themselves during the entire performance. Several times during the gig they had the entire crowd jumping along with Robert and Jody, whose ability to jump on heels that high is amazing by the way. But don’t let that remark get you the wrong idea, both of them are talented vocalists who bring the music alive on stage even better than recorded and there is no arguing with the instrumental skill of the rest of the band either. Aside from the band’s fantastic musical performance, they took out ample time after the concert to meet with fans, sign autographs and pose for photos, making the evening even more unforgettable for those present. It was nice to see a band care that much about its fans and I’m absolutely positive the fans appreciated the group making time for them. In short: Abney Park has once again proven exactly why they are at the top of today’s steampunk music scene with a superb performance that will no doubt linger as fantastic in the minds of everyone attending. Where they have produced several good CDs in the past, the music really comes to live on stage, and the energy of the band and the skill of their performance makes them one of those bands definitely worth traveling for to see in the flesh. Stay tuned for an interview with Abney Park next week! You can see more photos of the concert right here.